Teeth are important to your oral health. 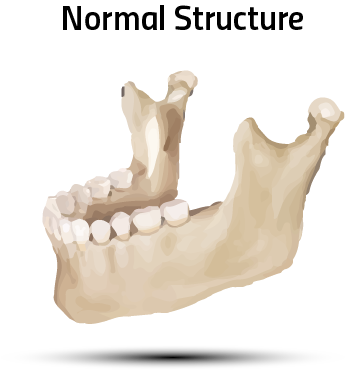 Without their stimulation, the jaw bone will slowly deteriorate and make wearing a denture uncomfortable and unstable. 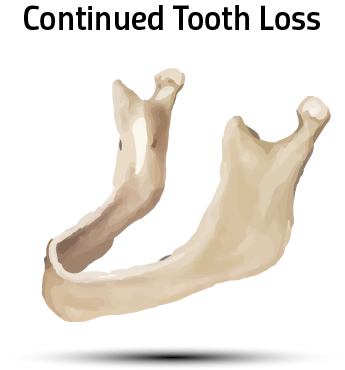 Click on a thumbnail below to view the progression of bone loss. Dental implants and dentures in Loma Linda, CA both replace missing teeth but the results are very different. Having implant surgery with Dr. Roger Sohn provides a permanent solution with better functioning and improved quality of life compared to dentures. Dental implants are available for one missing tooth or many, dentures are designed to replace several teeth. Dentures are obvious to most people but dental implants look just like your own natural, healthy teeth. Denture material can irritate soft tissue and feel uncomfortable to wear. Implants are made from decay resistant titanium that works comfortably with the body, not against it. Implants are permanent tooth replacement will not slip the way conventional dentures frequently do. Implants last longer than dentures. Implants provide increased confidence and freedom to eat and socialize without worry. 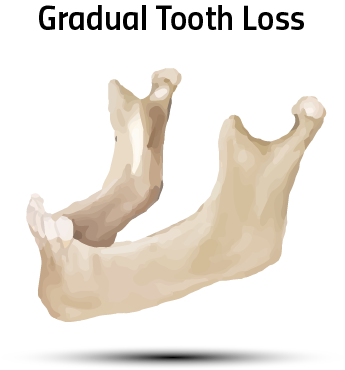 Dentures hasten bone loss, while dental implants help prevent it. Before dental implants, most patients resigned to wearing dentures to replace their missing teeth. Unfortunately, dentures can cause a variety of complications and hassles. These appliances are made with materials that can be irritating to gum tissue and damaging to the jaw bone. They also tend to look unnatural, can be difficult to stabilize on the gum line, and make eating and socializing a perpetual challenge. People who wear dentures may also find it harder to pronounce certain words and typically shy away from certain foods, including healthier choices, because they are too difficult to chew. Dentures do replace missing teeth but today, there is a better way. Dental implants make it possible for patients with missing teeth to have a completely natural looking smile with superior function and longevity. People with dental implants eat and speak effortlessly because just like tooth roots, implants are anchored in the jaw bone for a permanent, dependable fit. They are also made with a durable, nonirritating titanium metal that even offers natural protection against decay. The daily stimulation that the jaw receives from implants also protects and strengthens bone density, unlike dentures, which can actually perpetuate bone loss. For most patients with missing teeth, the choice is easy when it comes to choosing dentures in Loma Linda, CA or high quality implants with Dr. Sohn. Call us today for your personal implant consultation.